I can thank Highland Park for making peat palatable to me. During the early phases of my exploration of scotch, even a whiff would have been enough to be off-putting. And Highland Park, once I grew to like it, was enough to make me say "this is as much peat as I want in my whisky". Well, that was over three years ago and things have changed. Now I can drink Octomore and think "yeah, that's kind of peaty." So I was curious to see what I would think of this whisky after a radical expansion of my palate. Nose: creamy honied malt, oatmeal, raisin-y sherry, berries and plums, mild green mossy/smoldering peat, cured meat/barbecue smoke, wood smoke/barrel char, vanilla, spearmint, floral heather, coffee beans/mocha. After adding a few drops of water, it becomes softer and more integrated, with more vanilla. Taste: sherried malt sweetness up front, counterbalanced by mild oak tannins, with floral vanilla and citrus peel coming in around the middle and smoldering/mossy peat building towards the back. After dilution it becomes sweeter and rounder, with the oak and peat showing up at the very back. While a lot of the same elements are present as I found the first time around, it seems much more mellow than it did then. The violent swing from sweet malt and sherry to deep, dark peat isn't there. Instead it's a very drinkable and enjoyable whisky for when I want something interesting but not overly challenging. 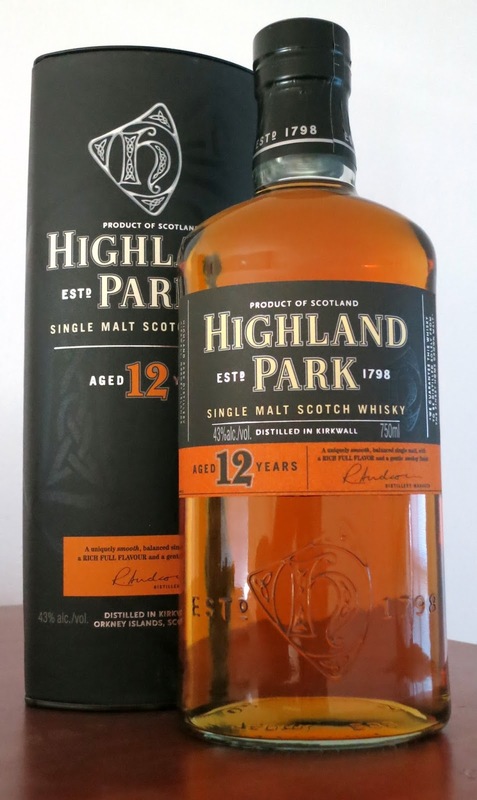 It's possible that this is due to batch variation, as Highland Park has been noted for significant swings in quality over the years, but I suspect that I'm just used to more extreme whiskies now, so this doesn't pack the same punch that it used to for me. With that said, I still highly recommend Highland Park 12 Year. It's a solid whisky at a solid price and even if it isn't quite the stunner that it used to be, it's still one that I quite like drinking. Tomatin is a distillery that until recently was known more for being another semi-anonymous Speyside distillery producing malt for blends. However, there has been a major push over the last few years to upgrade their line of single malts. As part of that push, they have occasionally bottled single casks for retailers, including a clutch of them in Minnesota. 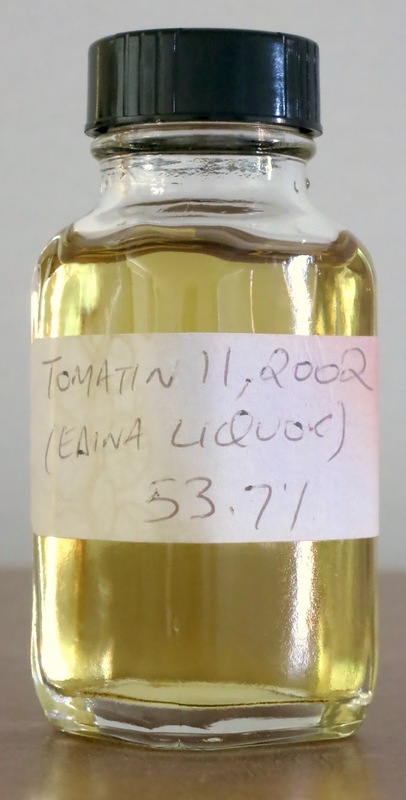 This first-fill ex-bourbon cask (#1830) was bottled for Edina Liquors by Tomatin at its full strength - 53.7% - without coloring or chill filtration. Nose: pears (fruit and skin), green grapes, raspberries, lots of biscuit-y green malt, Cream of Wheat, musky toasted oak, strong lemon/lime peel, vanilla. After adding a few drops of water, it becomes softer, with a bit of orange peel peeking out, and more new make character. Taste: fairly immature up front with lots of sweet green malt, new make notes, and citrus, fading into some fresh oak, floral esters, citrus floor polish, and vegetal notes, rather hot throughout. After dilution, it becomes softer and sweeter, with less new make, while the citrus notes gain some berry character, the oak fades and integrates with the malt, and is - if anything - even hotter. It is perhaps unsurprising from my notes that this one doesn't do much for me. As MAO noted, it should appeal to people who enjoy Glenlivet Nadurra, which is another one that I'm not terribly fond of. Which is to say that this is a particular style that doesn't work for me, but doesn't mean that it's a bad whisky. If this style works for you and you can't make it out to Edina, Ace Spirits has another single cask from the same lot at a rather reasonable $45. The story of this whisky begins over a decade ago, not long after the founding of Compass Box. Through his connections with his former employer, Diageo, John Glasser was able to obtain teenage casks of whisky from Clynelish and Caol Ila. He found that these played well with each other, which led to the creation of one of his early blended malts, Eleuthera. However, it was not long for this world. As single malts began to regain their popularity, aged Clynelish and Caol Ila became harder to obtain, John was no longer able to get the particular casks he needed for Eleuthera, so the product was allowed to lapse. Fast-forward nearly a decade and John was once again able to get some of the precious casks of Clynelish that were so integral to the original Eleuthera. However, instead of trying to precisely reconstruct that blended malt, he decided to tweak the recipe with some nearly twenty year old whisky from the far more obscure Allt-A-Bhainne distillery. 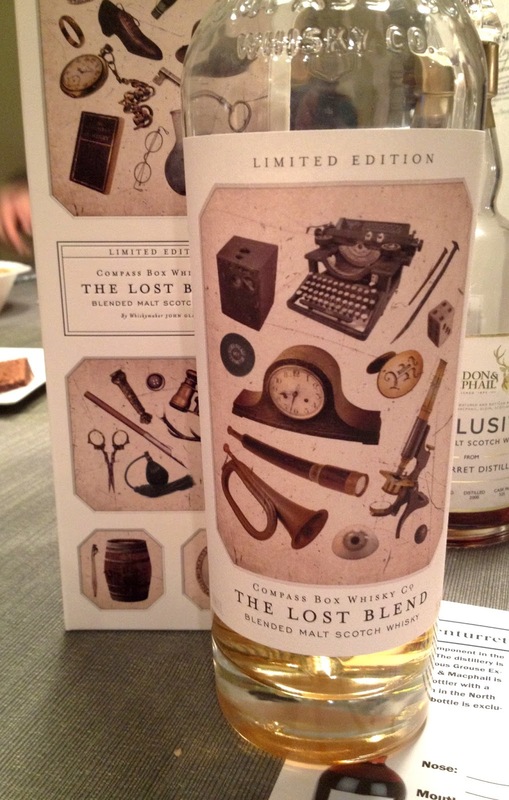 Putting those three whiskies together became the Lost Blend, an homage to but not a copy of the original. As with most of their whiskies, this was bottled at 46% without coloring or chill filtration. Thanks to Ian of PDXWhisky for letting me try this one. Nose: earthy/woody peat, a touch of smoke and cigar ash, rich caramel, undertones of seashore, cured meats, and berries, solid malt core, something green, honied oak, floral perfume. After adding a few drops of water, it becomes more integrated, there's more malt and oak while the peat takes on a more prominent role, and the floral notes become incense. Taste: malt and wood sweetness up front, segueing into creamy/waxy muddled fruit (berry, melon, citrus)/floral esters in the middle, with oak tannins and a touch of peat coming in around the back. After dilution, the peat and oak move forward to balance the malt sweetness, which tones down the fruit and floral elements a bit and brings in some bitter chocolate around the middle, and the creamy element gets some vanilla whipped cream character. This is, without a doubt, a very pleasant blended malt. While the individual components are all recognizable, the sum approaches a very lightly peated Highland malt. Nothing seems particularly out of place, though I would have liked the Clynelish to be a bit more front and center. Which brings me to my main complaint - while this makes a nod at the original Eluthera, it's much less assertive, likely because of the inclusion of the Allt-A-Bhainne in the mix that dilutes the more characterful Clynelish and Caol Ila malts. On the flip side, this is much more approachable than the original, so I think it will appeal to a broader audience. It's not quite enough to make me want to drop $100 for an entire bottle, but I would highly recommend trying a pour if you get a chance because it is a very well-constructed whisky and may do more for you. While Caol Ila is primarily known for its peated whisky, the distillery also produces unpeated 'Highland style' whisky roughly once a year. While this was originally done purely for blenders, it has more recently been bottled as a single malt for Diageo's annual Special Releases. Interestingly, all of the unpeated Caol Ila we've seen as single malts has come from roughly the same vintages, having been distilled between 1997 and 1999. At this point it's one of the few that doesn't cost an obscene amount of money, though I'd argue they're still asking too much for it. This particular release was made from whisky distilled in 1997 and bottled in 2010 at full batch strength of 57.6%, presumably without coloring or chill filtration. Nose: rich bourbon cask influence (caramel, oak, vanilla), fresh malt, seashore and very mild peat (but more of both with time) underneath, light Highland floral notes, cotton candy/bubblegum, a little berry compote. After adding a few drops of water it initially becomes more Highland-like with increased focus on the malt and fruit/floral esters, while the oak and peat hang out underneath, but the oak and peat reassert themselves after a while and give it a more earthy character, with some almost sherried notes peeking out. Taste: solid malt and cask sweetness tempered by first-fill cask tannins from the front to middle, creamy vanilla and fruit/floral esters around the middle, then more tannins and a touch of vegetal peat and barrel char near the back. After dilution it becomes a bit softer and more rounded, with the tannins spreading out but becoming a bit less aggressive. While not overly complex, I liked this whisky a lot. I can see why it's popular with blenders, as it would make a solid core for a blended whisky. As its unofficial name suggests, there's a lot in common with Highland malts, though it does retain some Islay character (though I pick up less of that than MAO did). There are arguments that the distillery doesn't clean its equipment very thoroughly between peated and unpeated runs, letting a lot of phenols get into the 'unpeated' spirit. More than anything though, this whisky shows how rich Caol Ila's malt can be when it's aged in first-fill rather than refill casks. With that said, the heavier oak does go some way towards covering up the more subtle notes, so it's definitely a trade-off. While there are still bottles from this release available, the price is just a bit too high for me to bite (especially from a giant distillery owned by a mega international corporation). 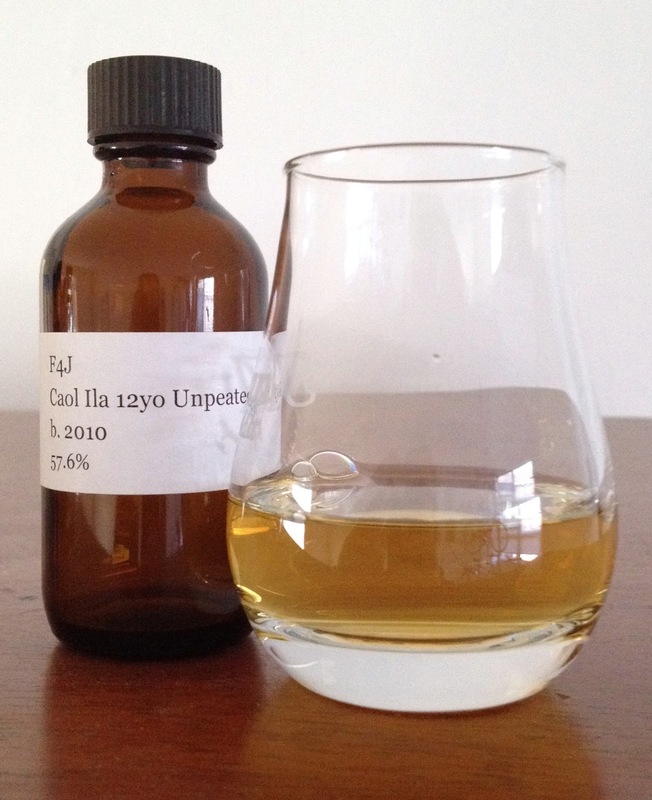 However, this version is significantly cheaper than the last couple of releases (and actually has an aged statement unlike Stitchell's Reserve), so it's probably a better way to go if you want to try an 'unpeated' Caol Ila. 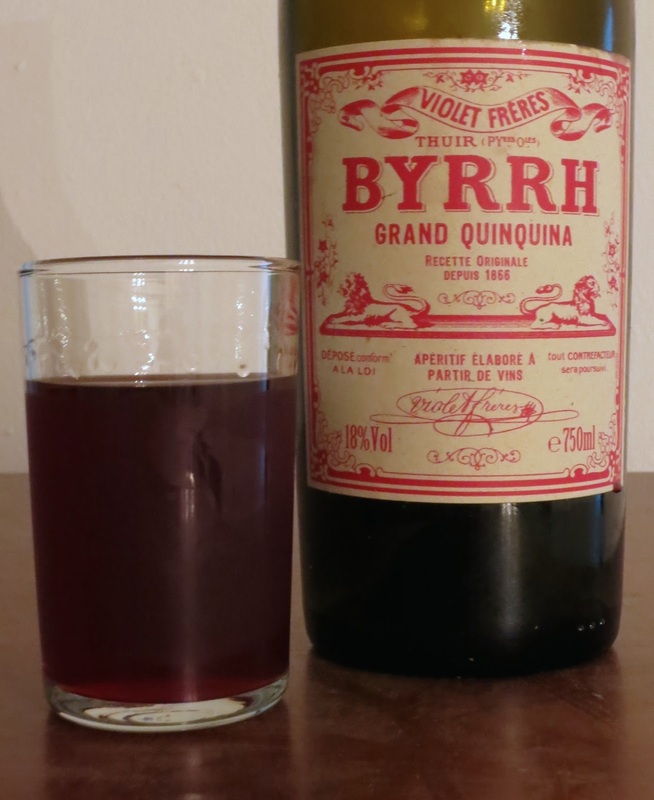 Byrrh is a French aperitif wine that is made bitter by the addition of chinchoa bark, which also gives tonic water its bitterness. It is made from a mixture of mistelle (similar to port - partially fermented wines from Carignan and Grenache grapes with neutral spirit added to halt fermentation and retain sugars) and dry red Roussillon wines. This mixture is flavored with chinchona and then aged for at least three years in large wooden vats. As with many aromatized wines, this one began as a purported health tonic. Two brothers created it in the region of Thuir in southern France in 1866. It went on to significant success, becoming one of the most popular aperitifs in early 20th-century France. Its star faded somewhat during the second half of the century, more or less disappearing from the States. 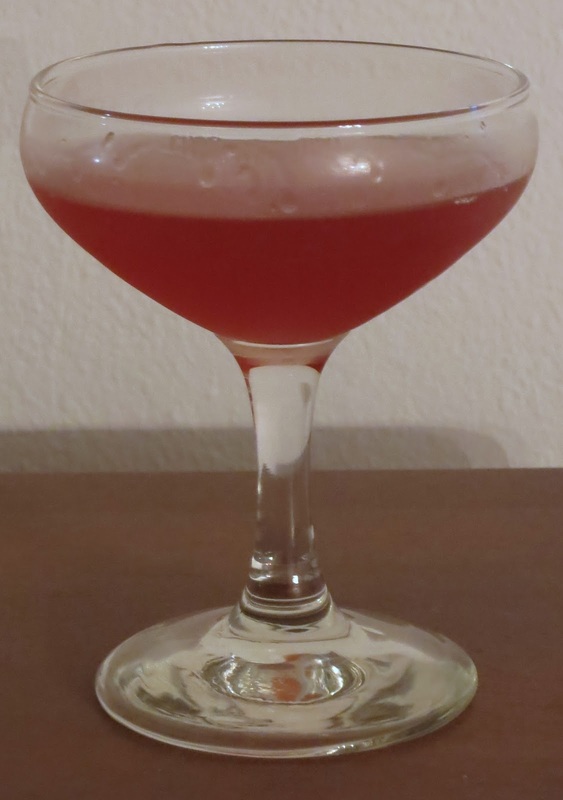 But with the uptick in interest in pre-Prohibition cocktail ingredients during this century, it was brought back to this side of the Atlantic by Eric Seed. While not a particularly complex aperitif, Byrrh is one of the few that I enjoy all by itself. While it is often served with a splash of soda, it is perfectly good neat as neither the sweetness nor the bitterness are overwhelming. This makes is a fairly good introduction to the category, though it won't disappoint the seasoned drinker. Combine all ingredients, shake with ice, then strain into a chilled cocktail glass. The nose is dominated by the rhum's grassy notes, with some of the fruit and floral elements of the Byrrh and St. Germain peeking around the edges. The sip begins with subdued sweetness, as the liqueur and Byrrh battle against the grassy bitterness of the rhum, which gives way to lemon pith and chinchona near the back. In some respects, this isn't the best display of Byrrh as the wine takes a supporting rather than a leading role, but it is a very good drink. You might be able to highlight it a bit more by using a softer rhum like Clément Première Canne, but I like the bigger punch that La Favorite Blanc provides. Braeval, formerly known as the Braes of Glenlivet until the owners of The Glenlivet decided to clean up their own brands before going after everyone else using the Glenlivet name, is one of the younger distilleries in Scotland, having been built in the mid-70s. Along with its sister distillery Allt-a-Bhainne, Braeval was built for and continues to produce almost entirely for blends. In keeping with that, the distillery is so efficient and automated that it can, in a pinch, be run by a single person. Single malts from Braeval, even by independent bottlers, are a bit thin on the ground. This particular ex-bourbon cask was bottled by Signatory for Binny's in Chicago at 56.9% without chill filtration or coloring. Thanks for Florin for the sample. Nose: a solid layer of mossy Laphroaig-y peat, beef fat, rich but not overpowering oak, milk chocolate, a hint of sour milk, Nyquil/menthol, clean green malt, vanilla, salty biscuit dough, musky lime peel, grilled pineapple, pears. After adding a few drops of water, the peat is tamed and integrated into the malt as herbal/vegetation notes with some hints of green smoke, the oak becomes sweeter and more polished, and the fat becomes charred. Taste: clean malt sweetness up front, which is slowly countered by a rising tide of mossy peat, polished oak and tannins, lemon/lime citrus, heather-y floral notes, green fruits (and skins) and melons. After dilution, the malt becomes softer and more grainy than sweet, with a big dose of vanilla in the middle, followed by much more tame peat and less fruit, but the alcohol becomes more pronounced. Interestingly, though the samples were all from the same bottle, I found more peat and seem to like this whisky a lot more than either MAO or Smokypeat. I think the peat helped to give it more balance to me than they found. I'm moderately inclined to pick up a bottle as it makes me think of a lighter bourbon cask Laphroaig or Longrow. It helps that the price isn't stratospheric.